Established in 1992, Optus is the second largest telecommunications provider in Australia. Set out to be the people’s champion, the brand offered choice in a monopolised industry, and regularly introduced game-changing innovations that forced the entire market to shift and follow suit. In previous years, Optus concentrated on price competitiveness and market growth. But as the market reached saturation, the company realised it needed to shift focus back to its customers. In order to win back its customers hearts, Optus began re-engineering itself with the goal to becoming the most loved service provider for customers. To do this, a new identity was developed, coinciding with the introduction of a whole series of improvements and innovations to its products, service, network and billing. 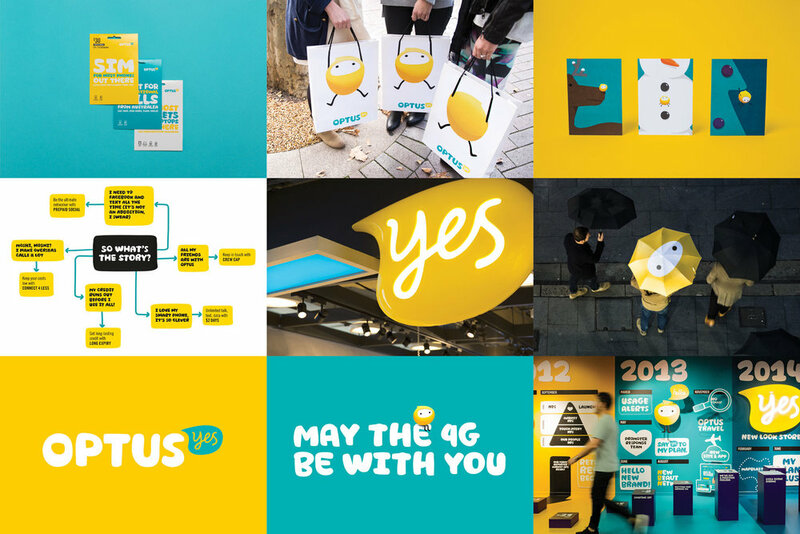 The new identity is designed to build greater positivity, optimism and an emotional connection with Optus customers. We created a brand character Olly (illustrated by Marco Palmieri) to become the wingman to customers and embody the brands personality. Whilst a new a bespoke hand-drawn headline typeface, Optus Voice (designed by Marco Palmieri) was created. The typeface became a critical piece of visual glue across the multiple channels the brand had to reach. We also gave the brand a new voice, one that was friendly, easy to understand, and peppered with a relaxed humour that never tried too hard. Together, these allow us to demonstrate how Optus has a useful and significant role in enabling the people of Australia to do the things they want with minimal stress and maximum ease. The brand stretched across multiple touchpoints over its three year stint. From top tier advertising to packaging, events, catalogues, environmental to fleet design and more. It differentiated itself from the competition, and pushed the status quo of telco branding – not just in Australia, but globally.